at the Huonville Town Hall, Huonville. 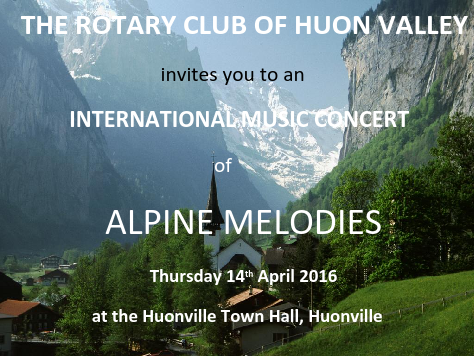 This concert will feature close to 50 performers with another visit to the Huon Valley by the MELI – MELO CHOIR. The evening will offer a program of music ranging from Sacred, Folk, Yodelling, Interlude with Alphorn and Bells, Accordion, Violin & Clarinet. Special performers will be the CANBERRA AUSTRIAN CHOIR. Bookings would be appreciated with Trudy on 62641311. $15pp with light supper at the Town Hall after the concert.